We’re talking a lot about creativity at the moment in agencies, aren’t we? What does it look like? Where should it come from? Who’s responsible? How best to harness it? There’s an interesting debate to be had, too, over the purpose of creativity within an agency. Is the model of creativity one built in support of new ideas that we can explicitly work up and sell to clients? In other words, a model focused on consolidating creative output within core, traditionally creative functions. This means we hire ‘creative’ people who demonstrably somehow different to the rest of us. Or is it something more devolved? A model where everyone across the agency is ‘creative’, whatever your job title? Because sure everyone’s role in an agency helps work get out the door? This is a model that requires creativity to feel more accessible, more within reach to those who don’t traditionally feel themselves to be ‘creative’ for whatever reason. This means we make the people we already have feel more comfortable with the processes of creativity. No agency in the world would say it doesn’t want more creativity at its centre. But neither would it disagree with what Seth Godin and Ken Robinson would say. That viewing creativity solely as the preserve of a certain ‘type’ is all wrong, and probably cuts you off from all manner of potential value that people can bring. Because the way creativity really works places it squarely within the reach of everyone. Anybody is capable of this. The difficult bit is making the connections within that knowledge. 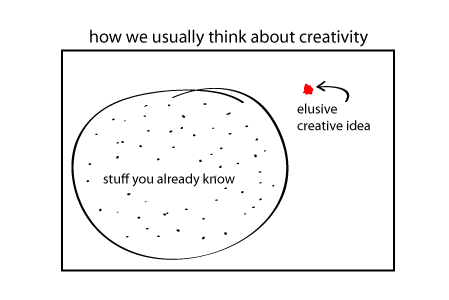 This is the subject of this magnificent post from Brain Pickings on networked knowledge and combinatorial creativity. Please do look at it. Or indeed any post from Brain Pickings. Also this amazing long-form essay on The Ecstasy of Influence, a hymn to plagiarism from Jonathan Lethem. Artists know that inspiration is often making something new out of something that already exists, and this heady twirl through some pretty highbrow examples will make a lot of people feel a whole lot better about stealing with pride. One intriguing example highlights the need for a really difficult element of the creative process – the he ability to re-contextualise what you already know. It’s what turns the familiar into the unfamiliar and new. But lets return to that earlier diagram. Making connections is important, but I think the implications go beyond that. It suggests the open-endedness of creativity. That creativity is never finished, or a box that’s ticked. That it relies on knowing more stuff so that you make more connections. Which in turn also raises an interesting question. Regardless of how we define creativity, is it creativity that agencies really want? Because, creativity, while apparently hard to describe and attain, can actually be harnessed pretty simply given the right processes and a certain level of organisational commitment. If more connections come from knowing more stuff, then really agencies need to inculcate a culture of curiosity. Which is a lot harder. Curiosity is an innate motivation. I suspect it’s established (or eradicated) early on. It comes from people, as opposed to being systemically engineered. But maybe it can be stimulated through feedback. Maybe we could work hard to make sure that curiosity isn’t merely its own reward. I don’t have any answers yet (as ever), but would welcome (also as ever) thoughts and responses…. Good topic James and one I think a lot of people in Ad-land will have contrasting views. It made me think back to a few meetings I had with a guy whose capacity to recall conversations and written words was truly a feat of memory. He could reel off facts and points of view from others in meetings that impressed the pants off people. But there was a problem I couldn’t quite put my finger on it until I got to know him a bit better. It became noticeable that he rarely contextualised his findings to suit the problem at hand. Rather he would lift them wholesale and crowbar them, even though they were ill suited. Stephen Johnson – Where Good Ideas Come From – applies the metaphor of creative idea generation being an overgrown bank of vegetation. Some ideas wither and die over time because they no longer relevant, some ideas prop up other broader ideas. I’m sure everyone has had the experience of a eureka moments that come completely out of the blue. When those connections establish themselves subconsciously. It’s as if those connections take a serendipitous route collating and rejecting ideas until it reaches a conclusion. Really good point to highlight the difference between knowledge and recall. I think you might have just revealed to me why i have an addiction to Only Connect! Repurposing disparate facts to find new patterns and implications is way more entertaining than watching people just remember stuff. I guess the other point here is that facilitating eureka moments is easier when you have multiple people. Is that why ‘creatives’ often work in pairs, perhaps? Nice read that I’ve just found here on the need to air ideas as early as possible to help them grow.